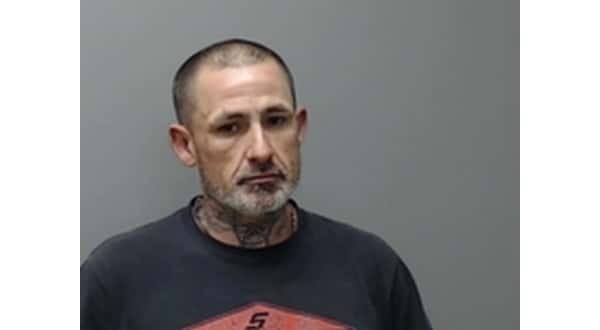 A Mountain Home man, 43-year-old Jimmy Sutterfield Jr., has been arrested following an incident in which he reportedly fled from a Cotter residence in a vehicle with the right front tire missing, leaving the roadway scored. The marks in the roadway allowed a Cotter Police officer to track Sutterfield's vehicle to Old Cotter Road, where it was found disabled. According to the probable cause affidavit, Cotter police responded to a hit and run incident Baxter County deputies were working Dec. 27th. The Cotter Police officer arrived at a residence along South Avenue in Cotter and learned Sutterfield had allegedly been in a verbal dispute with a female at the home. Sutterfield reportedly threatened to ram his truck into the residence with the woman and her children inside. The woman's juvenile son allegedly threw a chair at Sutterfield, and the two exchanged words. Sutterfield then reportedly got into his truck and purposely drove it into the juvenile's car, before fleeing. After locating Sutterfield's disabled vehicle, the Cotter police officer located the Mountain Home man at the residence listed on his vehicle registration, placed him in custody and transported him to the Baxter County Detention Center without incident. Sutterfield has been charged with a felony count of first-degree criminal mischief. His bond was set at $5,000.